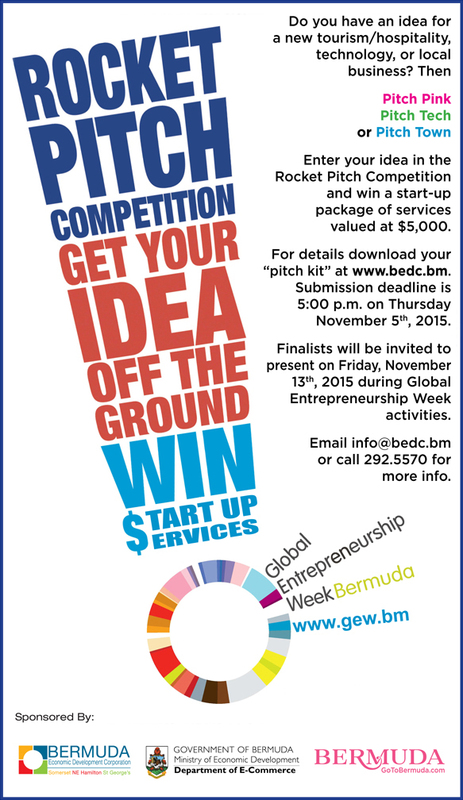 The Bermuda Economic Development Corporation [BEDC] has launched the eighth annual Rocket Pitch competition, sponsored by the Department of Ecommerce, which is being run as part of the upcoming Global Entrepreneurship Week, running from November 16 through November 22, and is open to all entrepreneurs. The competition will see participants have seven minutes to present a “Rocket Pitch” about a new business idea or a business idea that has been launched within one year. There are three separate industry categories: PitchPINK, which will see ideas for a new tourism/hospitality product or service; PitchTECH, including ideas for a new innovative technology or eBusiness idea; and PitchTOWN, with ideas for a new business with a focused on local customers. Following the initial presentations, a committee will invite the top entrepreneurs in each category to pitch publicly during Global Entrepreneurship Week on Friday, November 13. The top entrepreneur chosen from each category will receive a combination of Venture Funds and a Business Start-up Services valued at up to $5,000, on Thursday, November 19th at the Celebration of Entrepreneurship and Innovation. Dr. Marisa Stones, Director of E-Commerce, said, “Once again we are excited to be part of Global Entrepreneurship Week. We are proud to support the Rocket Pitch and, in particular, the PitchTech. The Department of E-Commerce believes the GEW initiatives provide a wealth of opportunity to our community. “For Bermuda’s entrepreneurs, GEW is perfect: it allows for the exploration of business development steps from opportunity recognition, through business planning, to final presentation. Increasingly, businesses must innovate to set themselves apart from others in the marketplace and PitchTech provides the right platform to propose technology-based ideas. Pat Phillip-Fairn, Chief Product and Experiences Development Officer, said, “The Bermuda Tourism Authority is very pleased to support the Rocket Pitch competition again, as part of Global Entrepreneur Week. Fostering opportunities for local entrepreneurs is key to growing the tourism economy. “Having more Bermudians involved directly in tourism, and benefiting from their own home grown ideas that reflect what today’s visitor wants, is a top priority for the BTA. Lucrecia Ming, BEDC Small Business Director, said, “This year participants will have the opportunity to work with coaches to refine their pitches. Based on feedback we received from previous years, it was determined that the access to coaching prior to the public presentation can assist the participant immeasurably and we are happy to be able to provide this layer of assistance. Senator Michael Fahy, Minister of Home Affairs, said, “The Rocket Pitch Competition is a competition that encourages existing and potential entrepreneurs to develop new business ideas. The BEDC, for the last eight years, has used this competition to encourage and inspire the next local entrepreneurs to come forward and move from the idea stage to implementation. “Over this time period the Rocket Pitch competition has aided in the development of fifteen new businesses in Bermuda. As the Minister of Home Affairs, I am encouraged about the future of the Bermudian economy when we can boast statistics like these to show that this one competition can aide in the establishment of new businesses and new jobs for Bermudians. BEDC Chairman Nick Kempe said, “This is the 8th year we have participated in GEW and we are pleased to continue to encourage and nurture entrepreneurs as they pursue their small business goals. If you have an idea and want to take the first step in getting started, I encourage you to present it within this competition. Submissions are due by 5.00pm on Thursday, November 5 and may be emailed directly to lming@bedc.bm. To provide further support to participants, the BEDC has uploaded a tutorial to its website on how to put together a Rocket Pitch. Five key components are highlighted as necessities for a successful Rocket Pitch and tips on pitching style are also available. For information about Rocket Pitch, email Lucrecia Ming at the BEDC at lming@bedc.bm, call 292-5570, or go to the BEDC website. Aged From 12-18 With A Great Business Idea?